Japanese saws cut on the pull stroke. You do not start the cut with the tip of the blade but with the back end - otherwise you have nothing to pull. You can use your thumb as you are probably used to, to guide the saw. Also as you will be used to, angle the blade a little towards the stock. Do not grip the saw with the very front of the handle but a little further back. In time, you will decide for yourself what the best grip is for you. Saw using steady, gentle pulls and only a little pressure. You can work out the best angle at which to hold the saw by changing it slightly a few times and observing the effect. Do not make the mistake of sawing too quickly at the beginning with too much pressure, or the saw will go off course. You can use two hands to saw larger stock. Keep your hands as far apart from each other as possible for this. If you are sawing wood from the wild or working very deep, be careful not to let the saw jam. Use a wedge at the start of the cut to keep the sides apart. Do not suddenly exert pressure - this brings the risk of jamming the blade. The effect could be a bent or broken saw or broken teeth. Also avoid bending the blade round or over - if a saw once gets a bend in it, it will not cut perfectly straight any more. Remember that most people who have to change a blade do so not because it is blunt but because they have mistreated it. The saw is not stainless, which is true of all the best cutting edges. Therefore, do not store in damp places! By this I do not mean you should overdo it, for a few drops of rain while you are working will do no harm as long as the saw is stored in the dry afterwards. If the saw is not to be used for a long time, oil the blade. Tap the front edge of the blade slightly against a hardwood block and you will be able to detach it easily. When you have inserted the new blade, again tap the saw against the block, this time with the short back of the Kataba or the long back of the Dozuki. 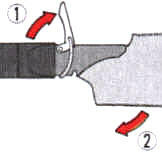 Open the lock as described at 1, hold the handle with one hand and the blade (watch out, it is sharp, use a cloth), and press the blade downwards as described at 2. Now simply detach it. Slot in the new blade and press it upwards again. Then the lock is activated. Check that the lever is seated in the groove.